The team at Applied Biomechanics is comprised of Fred Rayner (Certified Orthotist, Certified Pedorthist), Brad Carpenter (Certified Pedorthist), Mark Tonin (Registered Orthotic Technician, Certified Pedorthic Technician), Cathy Rayner (Office Manager), and Katie Loeppky (Reception). Our team works closely with other health practitioners in Guelph including Physiatrists, Orthopedic Surgeons, Family doctors, Nurses and Nurse Practitioners, Physiotherapists and Occupational Therapists. Fred is a Certified Orthotist under Orthotics Prosthetics Canada (OPC), and a Certified Pedorthist under the College of Pedorthics of Canada, and has been active in the profession of Prosthetics and Orthotics (Artificial Limbs and Orthopedic Bracing) since 1986. He holds an Honours Bachelor of Science Degree in Human Kinetics from the University of Guelph, and a Post Graduate Diploma in Clinical Orthotics and Prosthetics from George Brown College in Toronto, Ontario. Previous positions include Director of Orthotics and Certified Orthotist at Clynch Prosthetic and Orthotic Laboratories, Calgary Alberta and Professor in both the Postgraduate Clinical Orthotics and Prosthetics Program and the Orthotic/Prosthetic Technicians Program at George Brown College/Sunnybrook Health Sciences Centre, Toronto. Fred started his career as a Resident and then Certified Orthotist at West Park Hospital, Toronto. Fred’s academic interests include Biomechanics and Advanced Materials Technology and Fabrication. Fred also plays active roles in the profession both provincially and nationally. He is a member of both the Ontario Association of Prosthetists and Orthotists (OAPO), Orthotics Prosthetics Canada (OPC). He has sat on the Board of Directors for OAPO, has been involved in teaching the National Review Course put on by the OPC, and continues to be an examiner in the annual Certification Exams by the OPC. Applied Biomechanics Custom Orthotic Services is a proud sponsor of the Guelph Youth Basketball Association in the City of Guelph. Fred has been involved with the GYBA for many years as a coach, convenor, and as Vice President and Director of the program. It is with this same community focus that Applied Biomechanics works to serve the orthotic and bracing needs of the people of Guelph and the surrounding area …a local business at your service. Brad is a Certified Pedorthist under the College of Pedorthics of Canada with over 12 years of experience. Brad started his career in British Columbia, where he completed his Pedorthic apprenticeship and became fully certified in 2004. After working as a Certified Pedorthist for a number of years he was promoted to a Mentor position in the Pedorthic apprenticeship program. Brad has since moved back to Ontario to continue his Pedorthic career. Before joining the Applied Biomechanics team, Brad worked at a multi-disciplinary clinic in Burlington. This allowed him to work closely with a number of allied health professionals including Orthopedic Surgeons. 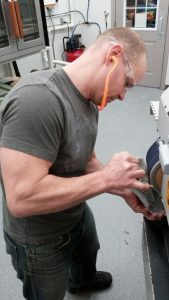 Mark is a Registered Orthotic Technician under the Orthotics Prosthetics Canada (OPC), and a Certified Pedorthic Technician under the College of Pedorthics of Canada. He has been active in the profession of Prosthetics and Orthotics (Artificial Limbs and Orthopedic Bracing) since 1991 and an examiner for the OPC Registered Technician Exams. He holds a Diploma from the Orthotics and Prosthetics Technician Program from George Brown College in Toronto, Ontario. Previous work experience and positions include Orthotic Technician at Otto Bock Canada, Burlington, Ontario. Our office is kept running smoothly by our professional and courteous office and reception staff. Cathy Rayner has been the office manager and partner at Applied Biomechanics since its’ inception in 1995. Cathy coordinates with the reception staff and can help you with all of your insurance and benefits questions. Katie Loeppky schedules all of our appointments and keeps us running on time. Katie is also able to work with you and help you with your footwear needs.